INTEREST FREE LAYAWAY, as low as $ 57.55/ mo. Details. A artistic polished italian modern round-edge 8mm band that was carefully crafted by hand and completely made in the U.S. 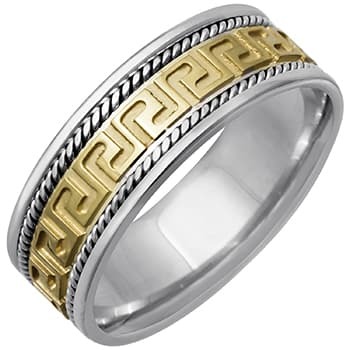 This 14k two-color gold band is made with white and yellow gold alloy that has 58.5% gold purity. White gold is light yellowish in color. Rhodium plating is done on the white gold portion of the band to produce a brighter white color, but the plating can wear off in time. The actual product color may differ on how you see the images on your screen. Your purchase is covered by a Lifetime limited warranty against factory defect. Comments: I just git the ring. I'm sure my baby will LOOVE it!